The Swisher 120V 22T electric log splitter is the perfect home accessory for fireplaces or wood-burning stoves. This log splitter provides a quieter option than traditional gas engines and can be used indoors on a standard outlet. The heavy-duty 2-stage pump provides maximum splitting performance. The splitter can function in both horizontal and vertical splitting positions. Just raise it with the beam lift handle and secure it in place with the vertical beam lock. The log cradles reduce the chance of the log rolling off the beam. Easily transport your splitter anywhere you want to go...it's road towable. Other features include: 25 opening, 1 machined steel compound wedge and a 2.5 gallon protected poly hydraulic tank. Lifan Power Equipments core business is our Industrial Grade Horizontal Shaft Engines. Our OHV (over head valve) design offers cool and fuel efficient operation. The engines are manufactured with a cast Iron cylinder sleeve and bore, which results in longer engine life. They also come equipped with Heavy-Duty ball bearing support crankshafts. All Lifan engines have automatic decompression for easy recoil or electric start, to negate backlash. The Fuel tanks are equipped with a built-in strainer to avoid trash getting into the fuel system. Equipped with dual throttle cable attachments, our engines are ready for every application. The Universal Mounting Bolt Patterns allow for replacement of almost all other brands of engines. Compatible with edgers, pumps, agriculture equipment, Go-Karts, pressure washers, log splitters, and hundreds of other applications. To ensure the absolute best customer experience, we stand behind out 1 year Commercial and 3 year residential Warranty. 22 Ton Log Splitter with 2HP Electric Motor The Swisher 120V 22T electric log splitter is the perfect home accessory for fireplaces or wood-burning stoves. This log splitter provides a quieter option than traditional gas engines and can be used indoors on a standard outlet. The heavy-duty 2-stage pump provides maximum splitting performance. The splitter can function in both horizontal and vertical splitting positions. Just raise it with the beam lift handle and secure it in place with the vertical beam lock. The log cradles reduce the chance of the log rolling off the beam. Easily transport your splitter anywhere you want to go...it's road towable. Other features include: 25 opening, 1 machined steel compound wedge and a 2.5 gallon protected poly hydraulic tank. 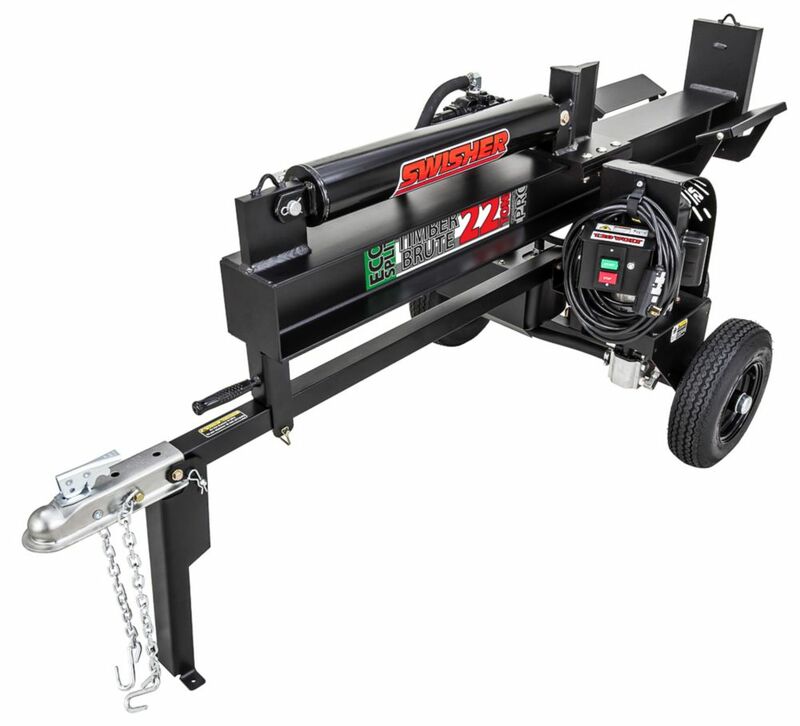 22 Ton Log Splitter with 2HP Electric Motor is rated 3.0 out of 5 by 2. Rated 1 out of 5 by Mike from Horrible Instructions The 8ft. crate that ir came in is big enough to allow shipping an assembled unit. Why they chose to break it down into components is beyond me. The instructions are printed so small that you can't see the detail as to how to assemble. I'm stuck on Step 1 assembling the wheel assembly and can't figure out how to get past this one. Rated 5 out of 5 by Woodchuck from Excellent product, excellent customer support "Some assembly required," and it weighed about 600 pounds, but it was easy to uncrate and assemble by myself. However, after assembly it would not start. The GFI plug would not reset, so I called warranty support and had a replacement power cord queued. However, the next day the Swisher product engineer called me to try to find out the root cause of the problem in case there was something in the manufacturing process that needed correcting. He walked me through a diagnostic procedure and we determined that it simply had a defective GFI plug. He sent a replacement by priority mail, and with that installed on the existing power cord the thing worked like a champ. I've split about a cord of red fir so far--it is easy to start, quiet, has enough power to split anything I can lift (up to 3-foot diameter), and is a joy to use compared with a gasoline-engine model. Further, it is easy to move, compact to store, and I can use it inside my building. I can re-split a gnarly, knotted log from my ready-wood-pile by simply flipping a switch and throwing the hydraulic control lever, then flipping the switch off.